Shop Our Other Items >. 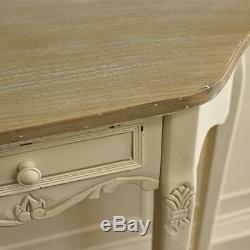 Cream Wooden Console Table Drawer Shabby French Chic Country Living Room Hallway. 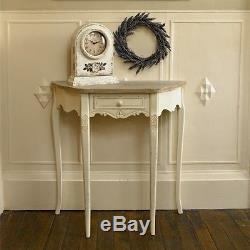 Cream painted wooden Half Moon Console Table. Pretty half moon table in cream with country styled wooden top. Ideal side table for living room or hall with a cottage look. Features a mildly distressed effect on the paintwork to enhance that farmhouse feel and a small drawer in the centre. Provides a useful surface for a hallway or living room or could also be used as a small dressing table in your bedroom. The main attraction of the item is its slim curved legs and rustic look with many more items in this range to compliment any room. Material type: MDF & Pinewood. 80cm x 30cm x 79cm (width x depth x height). From the Country Ash range this Console Table is useful in the hall, or as a side table elsewhere in the home. It follow a half moon (demi lune) shaping with 4 legs, and a small drawer at the front centre. It is made from wood, painted cream, with a distressed finish, and carving to the front and side fascia. The overall size is80 cm x 30 cm x 79 cm (width x depth x height) and arrives partially assembled. Welcome to our MelodyMaison e-shop! We've been around since 2004, starting off as a one-woman, one spare bedroom band, we now have a super-duper glamorous warehouse and showroom near Doncaster. In those years we have become a leading retailer for shabby styled French chic, Vintage style, French boudoir and cottage chic Home Furnishings, Wedding decor and Home Accessories. Customer service is our number one priority, if you have a problem with your order or if you think we can improve anything, let us know and we will try and learn from it. We always treat my customers as I would wish to be treated myself. I personally take the most pleasure in sourcing and adding new lines to this website. I promise to add new products on a regular basis, so do keep visiting our site so there is always something new for you to see each time you visit. At Melody Maison, we hope you will agree we have lots of beautiful things! Headed by myself, my passion is for sourcing unique & gorgeous new cottage style, boudoir,'shabby' styled worn chic French furniture and accessories and is what spear headed MelodyMaison to be born in the first place. We really value your custom and hope you enjoy our shop! We will also advise you on the day of dispatch that your order has left us. Please note this item may carry an additional charge for Scotland and Non-Mainland addresses, please ask. These terms and conditions do not affect your legal rights. The item "Cream Wooden Console Table Drawer Shabby French Chic Country Living Room Hallway" is in sale since Wednesday, March 21, 2018.